Online skill-building to develop the communication competencies that earn trust, improve outcomes, and bring joy to the practice of medicine. 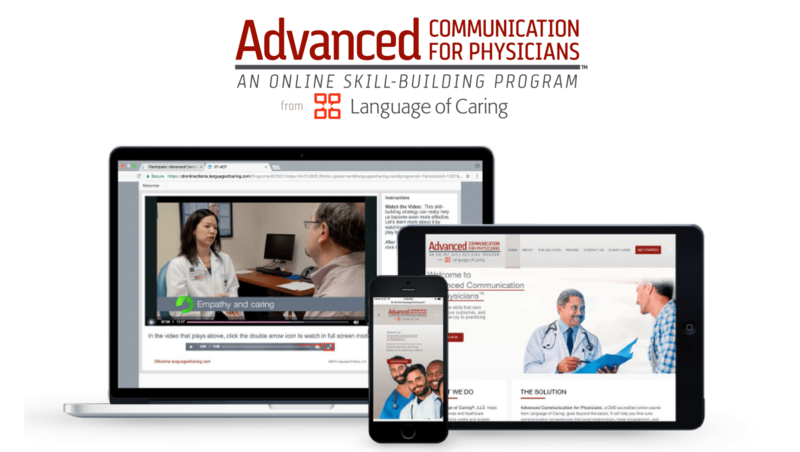 Language of Caring® is excited to announce the launch of our new education program for providers, Advanced Communication for Physicians™, a powerful online CME program that helps physicians and APCs fine-tune their communication competency in interactions with patients and colleagues. Visit the website to learn more and get started. Advanced Communication for Physicians goes beyond the basics to help physicians develop the communication competencies that build relationships, foster engagement and collaboration, and strengthen professional pride and effectiveness. This program is cost effective and highly efficient, designed for providers to complete online (on any device) and individually at their convenience. You want an efficient, cost effective strategy for helping providers in your organization improve their communication competency. You want an online program that individual providers can complete at their own convenience and location, without group sessions. You are an individual provider who wants to build your own skills and earn CME credits. Your organization is a professional association with provider members. You want to offer members value-added learning opportunities vetted for proven effectiveness. Developed by Wendy Leebov Ed.D., Carla Rotering, M.D., and Jeremy Blanchard M.D. Curriculum is grounded in extensive research. Respects providers’ extreme time constraints with short, high-impact modules that can be completed anytime. $399 $299 per year w/ Save25 code at checkout. Includes CME certificate for successful completion. To start this program today, click here. Learn about our strategy that engages and builds community for your team of providers by visiting the Language of Caring for Physicians® program.